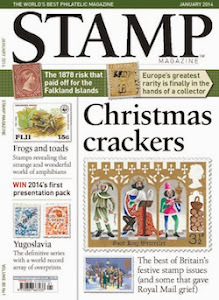 Being a member of a local stamp club may give you the added perk of getting the club packet. Ours is a number of shoe boxes per year, filled with books full of stamps. Mint, used, all world, with usually some covers and cards included as well. 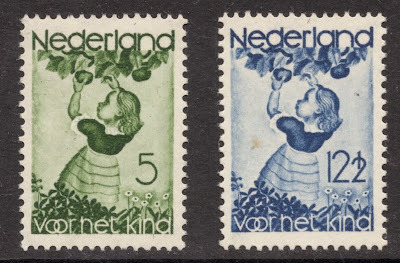 I just received my first one of the season and whilst looking at the books I noticed one full of Dutch stamps. And there was even a set which I didn’t have yet, so I snapped that one up straightaway. 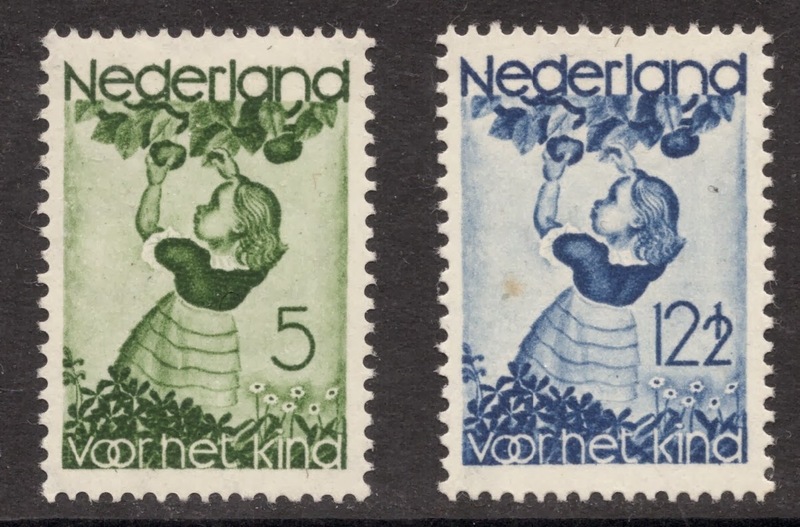 It was the 1934 Child Welfare set, depicting a child picking fruit. 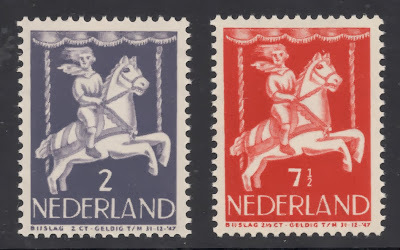 Four identical stamps in different colours. I immediately felt a serious bout of nostalgia coming on. 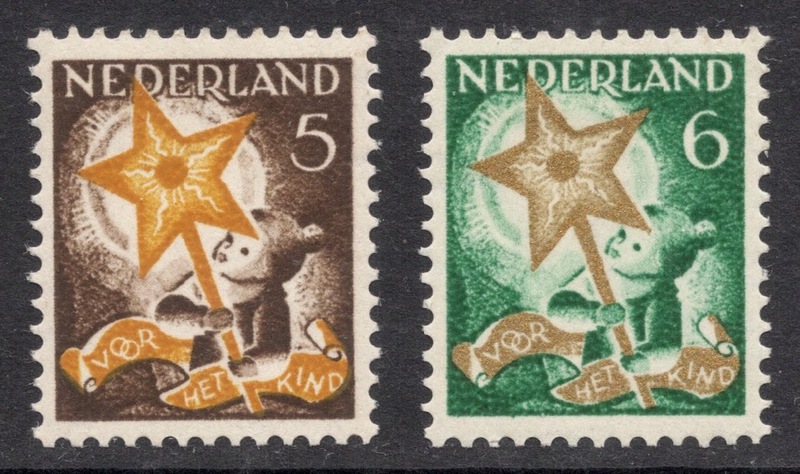 I suppose this set is typical of why I started collecting stamps. 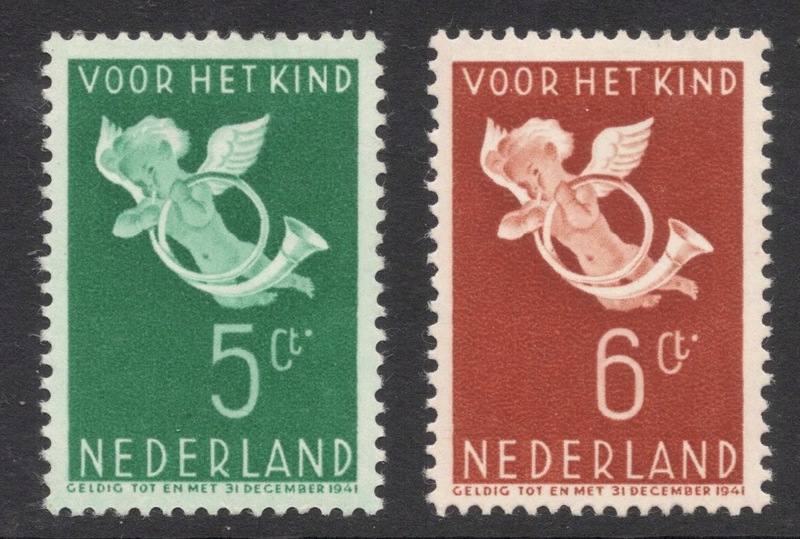 The Dutch stamp catalogue up to the 1950s is full of similar sets: series of 4 to 5 stamps, all the same, with only different colours and values. A bit like commemorative definitives. And the Child Welfare stamps come top in that category. 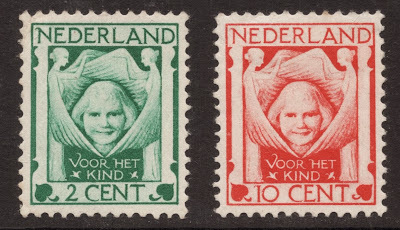 They started out in 1924 with three stamps of a child’s head surrounded by angels. 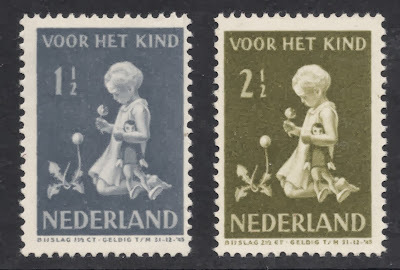 The year after, the spell was immediately broken by stamps which had different provincial coats of arms on, but from 1933 on, all Child Welfare stamps followed the pattern of a single design in different colours. 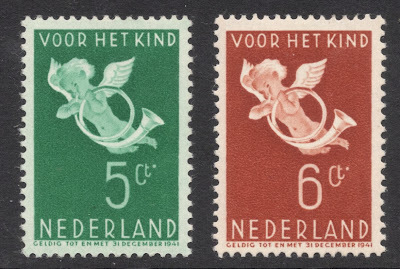 Nothing used to thrill me as much as wondering what the stamp would look like in olive-green rather than the grey-violet version I already had. And the even greater thrill to finally complete a set. Oh, how wonderfully beautiful they looked in my album! Not for me the more modern sets of the 1970s with various designs, sometimes hardly belonging together, with landscape and portrait stamps being thrown in ill-advisedly. No, I steered clear of those and always browsed longingly through the 1930s section of my catalogue. Nothing much has changed, I’m afraid. 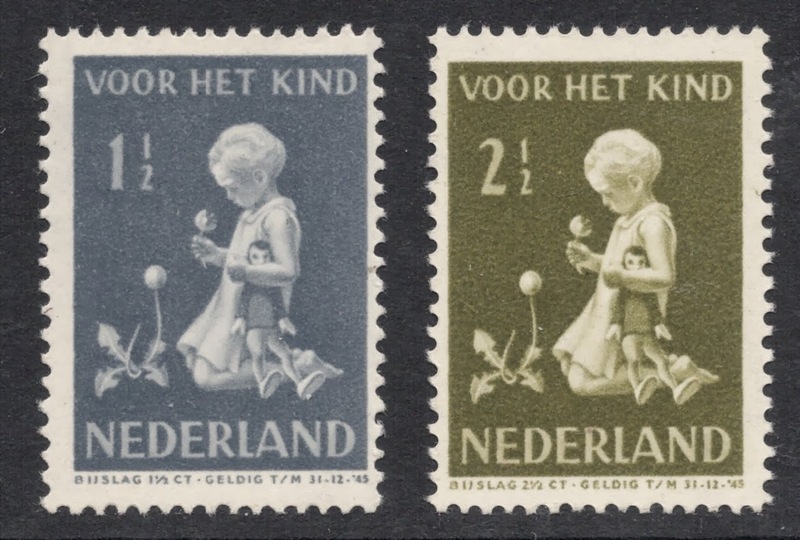 If I had to limit myself, I would still only choose definitives and commemoratives consisting of single designs. That’s why I was so delighted with this set from the club packet. Though I must admit the best ones are those that have a solid background and an illustration which is almost like a bas-relief or a drawing in Chinese white. 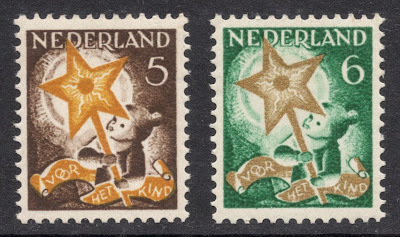 The designs have an almost magical effect on me and really are philatelic relics from my childhood days. Having said that, my all-time favourites are actually the two sets that were based on classic paintings. 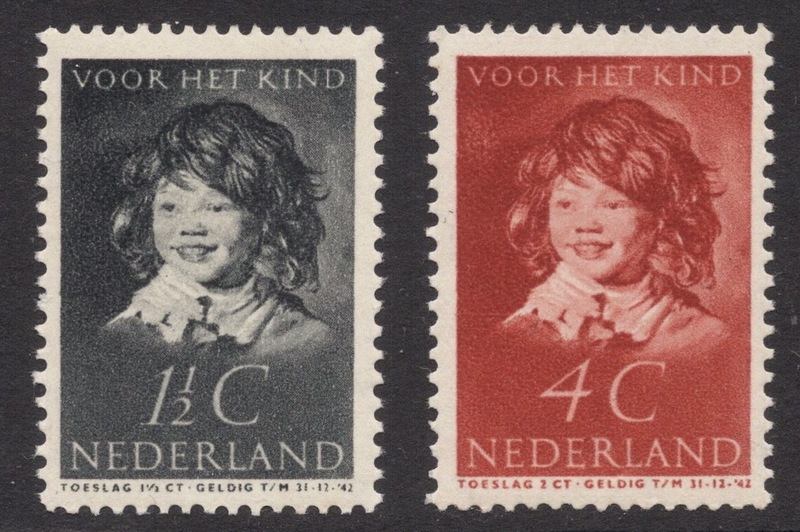 In 1941, Rembrandt’s son Titius was portrayed (I’ve shown that one in a previous blog, see here), and in 1937 Frans Hals’ ‘Portrait of a Boy’ was used. The final Child Welfare issue in single design was the 1946 set, depicting a boy on a roundabout. After that, the sets became just like any other set, though still based on a single theme. But if you want to go for some Dutch modern classics without descending into modern wackiness, you could do worse than collecting these issues from the first half of the century. There’s plenty there to keep you busy, even on a specialised level, and your pages will look so good! excellent piece. 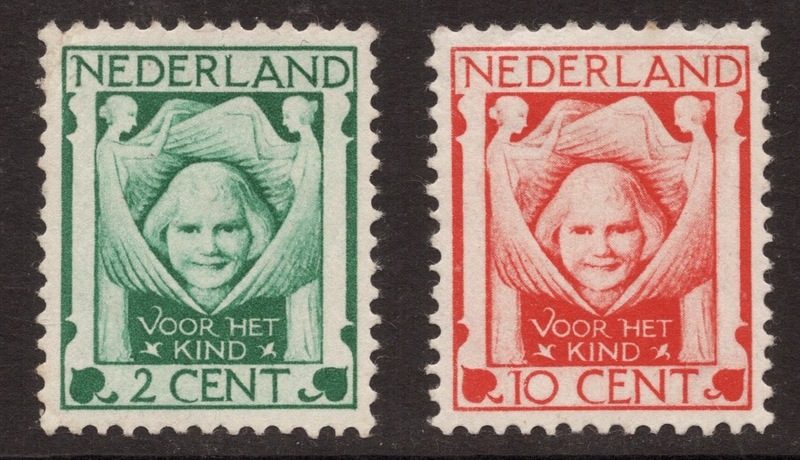 Great stamps and interesting theme. "Not for me the more modern sets of the 1970s with various designs, sometimes hardly belonging together, with landscape and portrait stamps being thrown in ill-advisedly. No, I steered clear of those and always browsed longingly through the 1930s section of my catalogue. Nothing much has changed, I’m afraid. 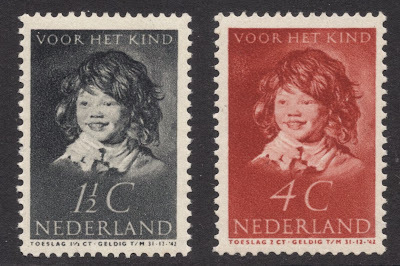 If I had to limit myself, I would still only choose definitives and commemoratives consisting of single designs." Adrian- your heart is that of a true WW classical era collector. I have the same affliction. ;-) Thanks for the great write-up.